The Glow Research AutoGlow plasma system was used to treat Fused Deposition Modeling (FDM) material parts. -The plasma treatment resulted in a 50% improvement in shear strength over untreated specimens. -Samples that underwent plasma treatment and epoxy infiltration demonstrated a 130% increase in flexural strength over that of as-printed FDM material. Plasma treatment has been shown to improve bonding in a number of polymer systems as well as a few structural composites materials systems with promising results. -The plasma can activate a species such as oxygen gas forming a highly reactive atomic oxygen free radical. -This highly reactive species can then interact with the outermost nanometers of the treated surface forming chemically bonded polar groups such as carboxyl, carbonyl, and hydroxyl moieties. -These chemical groups on the substrate have been shown to further react with the adhesive used for bonding to form strong chemically bonded interfaces. -In addition, plasma treatment has been shown to effectively remove low molecular weight hydrocarbon contaminants as well as promote localized etching of the material which may also contribute to improvements in interfacial bonding. This paper investigates the effect of vacuum plasma treatment (in the Glow Research AutoGlow system) on the wetting characteristics, surface chemistry, and shear strength of epoxy infiltrated FDM processed ABS parts. The paper evaluates whether the effect of these processes can further improve the flexural strength of vertically manufactured FDM parts. Finally, the effect of carbon fiber filler concentration on the mechanical performance of the infiltrated system is also evaluated. 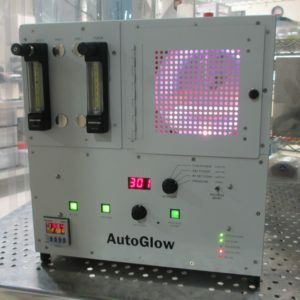 Plasma treatment of the 3D printed ABS material was performed using an AutoGlow Plasma treatment chamber (Model 200, Tempe, AZ, USA). Specimens were 3D printed into 3.8 cm (outer diameter) annular specimens with an inner radius of 1.2 cm. Each of these specimens was placed in the plasma treatment oven and treated at 13.56 MHz. The specimens were placed under vacuum and the oxygen active gas was flowed in at a rate of 2.5 cc/min. The power was then initiated to start the plasma and held for various durations (0, 1, 2, and 5 min) to optimize the surface treatment condition of the ABS material. The infiltrate was then poured into the center annulus within 1 h of treatment. After determining the optimum plasma treatment condition (1 min) for improved bonding, the effect of epoxy infiltration and surface treatment on the flexural properties of vertically processed ABS parts was evaluated. The specimens that were surface treated for 1 min prior to infiltration show an increase of over 121% in flexural strength over the base vertical printed ABS parts. Plasma treatment improved wettability and shear strength by promoting chemical bonding between the FDM processed ABS and the infiltrated epoxy. Oxygen containing functional groups were observed to maximize on the surface of the material after only 1 min of treatment. Increases of over 50% in shear strength were observed after 1 min of plasma treatment. The combined effects of plasma treatment and epoxy infiltration resulted in an over 120% increase in both flexural strength and strain over the as printed condition. The addition of milled carbon fiber filler to the infiltrate was shown to have negligible increases in flexural strength but yielded as high as a 40% increase in stiffness over the unfilled epoxy. 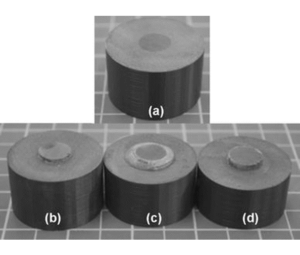 Epoxy infiltration combined with vacuum plasma treatment is an efficient way of improving mechanical properties of 3D printed structures in inherently weak print orientations. 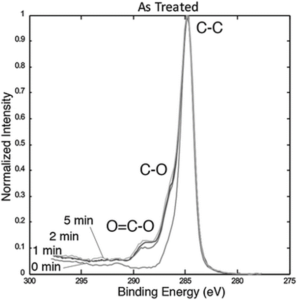 The peak at 286.3 eV is attributed to alkoxy groups (C–O) while the peak at 288.8 eV is representative of carboxyl groups (O–C=O).